Our latest ALIS controller houses an Applanix POS/AV-5 and a fan-less Intel i5-based computer in a 3U instrument case. In addition to managing power and interfacing for these components, it also manages incoming power from the aircraft with an optional second power input. The input power is steered through power diodes to prevent interaction, then filtered, providing 12dB/octave noise attenuation. Power input sources and the Scanner output supply are selected and protected with aircraft-certified circuit breakers. Access is available to two solid-state hard drive bays from the front panel. The front panel power input, labeled: GND POWER, usually a ground power battery pack, is monitored by a Curtis “battery fuel gauge” . 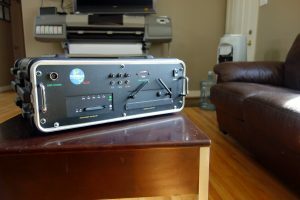 When no aircraft power is available a 24V battery supply will run the computer and POS system for hours using two 12V 17AH Gell Cells in series. If the battery pack is at full charge you can also run the entire system, including the laser scanner, for a few minutes. Overdoing this risks damage to the batteries, however, and is not intended as regular practice. Two rear panel BNC connectors provide independent optically isolated contact closures. GPS is available to the cameras via the DE-9-M connector pair labeled GARMIN. Note that the camera is receiving its NMEA data from the pilot guide, so the Garmin shares its transmitted data with the camera. 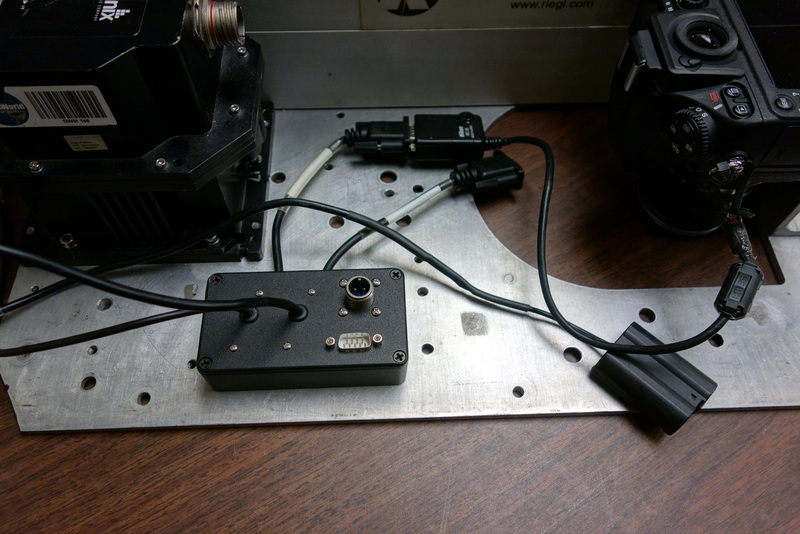 The Camera Distribution Box is located on the plate where the cameras are mounted. It gets a 24VDC feed from the system, contact closures (4 wires) for two cameras and GPS NMEA data. Inside the box are 2 independent DC-DC converters that provide 7.4VDC rails for the cameras. These are connected to the battery eliminators exiting the front of the case. The GPS and contact closures are routed to the MC-35 adapters exiting the side of the case. Nikon accessories (for the D800) are Battery Replacement Pack: EP-5B, GPS adapter: MC-35. Note that the MC-35 must be modified for use in this application in order for shutter release to use the 10 pin connector on the Nikon D800.